Recently, I got into a conversation with a book collector friend of mine about collectible broadsides. This discussion forced me to realize that I did not really know what a broadside technically was. I knew one when I saw one. In bibliographic terms, a broadside (or a broadsheet) is merely a large sheet of paper printed on one side only. As a result, a poster, a handbill, and an advertisement, as well as a printed poem, can all technically fit the definition. (For a full set of dictionary entries concerning the term broadside, see Google). For the collector of modern books, the term usually refers to a single poem sometimes accompanied by artwork printed on a single sheet by a fine printer. Ken Lopez Booksellers has a large gallery full of wonderful examples of this fine press art. The first thing that pops into my mind when I think about the collectible broadside is Black Sparrow Press and Charles Bukowski. In 1966, the first four publications of Black Sparrow Press were broadsides of Bukowski poems: “True Story,” “On Going Out to Get the Mail,” “To Kiss the Worms Goodnight,” and “The Girls.” From these humble beginnings, John Martin built one of the most important presses publishing modern poetry in the world. In fact, these beginnings were not really humble, but a rather impressive example of printing and marketing. Martin produced these broadsides specifically for the rare book market. The first four broadsides were handset poems on expensive, deckle-edged paper signed by Bukowski in a limited edition of 30. The layout is simple, yet elegant placing much of the emphasis on the poem not the design. This type of care in presentation continued the tradition of Bukowski publications like It Catches My Heart in Its Hands and Crucifix in a Deathhand by Loujon Press. The poems were pricey at $10. It was a pretty good investment as these pieces now fetch $3000-$4000 on the market today, if you can find one. These items are legendary rarities and almost never show up in collectible condition. Black Sparrow Press published Bukowski as a broadside artist throughout the life of the press. The poems and their design have become iconic examples of small press publishing. Several members of the Beat Generation have been published in the broadside format. For me, the most interesting examples are the broadside / pamphlets published by City Lights in the 1950s. I am thinking of Jack Kerouac’s Rimbaud, Gregory Corso’s Bomb and Bob Kaufman’s The Abomunist Manifesto. Technically speaking, these poems are not broadsides as they were printed on both sides of a single sheet of paper, but booksellers often list these heavily sought after items as such. They are notoriously fragile as they were cheaply made on even cheaper paper: the opposite end of the spectrum from the Black Sparrow offerings. Like the Pocket Book Series, these City Lights poems were portable and inexpensive, usually 50 cents. The first printings of Rimbaud and Bomb are now $150-250. The Beats have also received the high-end treatment. Broadsides of Gary Snyder and Philip Whalen incorporate the poets’ artwork and calligraphy in beautiful examples of the printer’s art. I am thinking of Philip Whalen’s “Goddess” published by Auerhahn Press in 1964. An archive of material dealing with “Goddess” is currently being offered for sale by Ken Lopez. Several printers issued broadsides of Allen Ginsberg as well. One of the most famous collectible broadsides celebrates Jack Kerouac. A Pun for Al Gelpi is a parable involving Jesus and an apricot tree published out of Harvard University in 1966. This is one of the scarcest Kerouac items at 100 signed copies selling for roughly $4000. Not surprisingly, there are a few broadsides in William Burroughs’ bibliography, but not as many as other Beat writers. This may be because Burroughs is largely a prose writer and the broadside most effectively celebrates the poem. In any case the broadside has played a role throughout Burroughs’ literary career. These appearances divide into two camps: the broadsides that appeared largely in association with magazines in the 1950s and 1960s and the fine press publications later in his career. Taking an expansive look at broadsides, the most interesting examples in Burroughs’ work of the 1960s are posters: “Martin’s Folly / The Moving Times” in Sigma Project 1, “The Invisible Generation” from Sigma Project and Michael English’s “Invisible Generation Word Machine Poster” in International Times. I will discuss these posters in detail at a later date. Briefly, the Martin’s Folly poster returns the broadside to its newspaper roots in the 19th Century as a dispenser of information pasted on a barndoor. It also challenges the traditional newspaper / broadside / poster formats. The Michael English poster links to the Dada posters of continental Europe after WWI, particularly the machine drawings and blueprint diagrams of Francis Picabia. The Invisible Generation piece highlights the definition of broadside as a frontal attack in its revolutionary message. The magazine appearances of the 1950s and 1960s also utilize the broadside as a means to challenge tradition in this case the look and definition of a magazine. This is most obvious in Semina 4 that produces Burroughs’ “Excerpt from Pantapon Rose?” According to Maynard and Miles, “Pantapon Rose” is “printed on yellow tissue and contained in a pocket located as p. 3 of a folded card cover. The pocket contains 21 separate items in no specific order.” I have previously discussed how Semina sought to redefine the magazine and how it lies in an established tradition of experimentation. The idea of freeing the magazine from the bound format by the use of broadsides captured the imagination of many editors in the 20th Century such as Phyllis Johnson of Aspen and Daisy Alden of Folder. Interestingly, Charles Bukowski’s second appearance in print followed just such a format. In 1946, Portfolio published Bukowski’s “20 Tanks from Kasseldown” as one of several broadsides from authors such as Henry Miller, Kay Boyle, and Jean Genet. These pieces were placed as separate leaves into a large, unbound collection. Two other magazines featured Burroughs broadsides in the 1960s and both magazines experimented with layouts and typography. The Spero published Burroughs’ “The Coldspring News” in 1965. Like the “Martin’s Folly” poster, this broadside plays with the 19th Century single sheet newspaper format in an avant garde manner. The three column layout allows Burroughs to experiment with visual and textual cut-ups and to display his theory that much of everyday experience is in fact a cut-up. The Spero issued the broadside in three separate ways. First, “Coldspring News” was bound in a limited number of issues. Secondly, it was tipped in and finally Spero issued it as a separate, freestanding piece. The “Coldspring News,” which is included in The Burroughs File, was not the only broadside included in The Spero. In addition, the magazine experiments with an array of type fonts and formats. Included at the end of the issue is a separate publication by small press publisher of Jargon Press and writer Jonathan Williams. This item, like the magazine, takes joy in various typographies and treats words as physical objects to be appreciated on the playing field of the page. Philadelphia’s Brown Paper, a one-shot magazine from 1965, displayed a similar interest in typography and layout. The magazine’s title highlights an interest in ephemera and in the physicality and variety of paper. In a pocket at the end of the magazine, several broadsides are tipped in including a Burroughs cut-up. The editors sent Burroughs a parody of the cut-up technique that Burroughs promptly re-cut up and returned as a new piece. The editor published the results. The other appearances in Brown Paper reveal a care in the placement of the poem on the page as the pages are expansive and take advantage of large margins and blank space. Not surprisingly, even the paper of the magazine makes a statement with its textuality, color and size. One of the most famous broadsides of Burroughs’ bibliography is not technically a broadside at all. The separate appearance of The Dead Star published as a Nova Broadcast in 1969 is in fact printed on both sides of a single sheet of paper. This piece appeared as a special issue (The Dutch Schultz issue; Numbered 13) of Jeff Nuttall’s wonderful and daring My Own Mag published out of Great Britain. The Nova Broadcast is part pamphlet, part broadside and part chapbook. 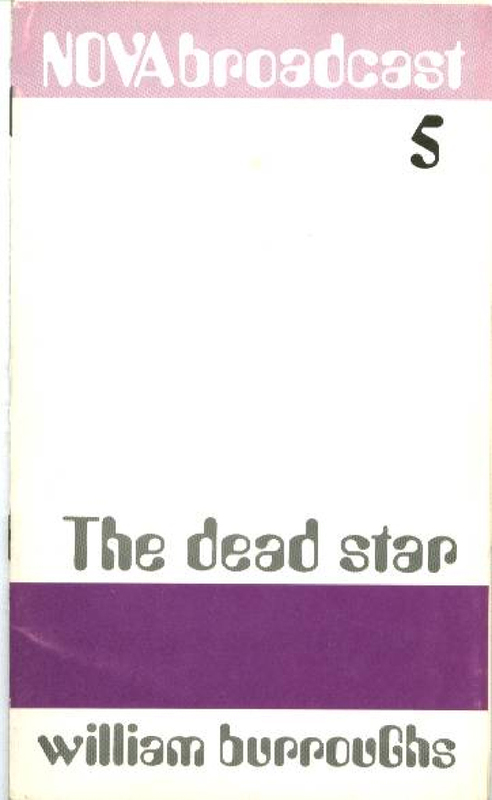 Although a slim publication, The Dead Star stresses its presence as a physical object and demands to be opened, spread out, and handled as well as read. The publications of the 1970s onwards demonstrate the more traditional aspects of the broadside accentuating the broadside as a collectible and example of fine press printing. The two pieces that stand out in Burroughs’ later bibliography are “Where Naked Troubadours Shoot Snooty Baboons” and “Wouldn’t You Polish Floors with a South Africa Ostrich and eat an Albino Gorilla?” Both broadsides are limited editions and signed by Burroughs. Toothpaste Press published “Wouldn’t You” to celebrate a reading at the Walker Art Center in 1979. “Naked Troubadours” was published in 1978 in collaboration with illustrator James Silke. These pieces are prose-poems, but Burroughs has also created the more standard poetry broadside. In 1995, the lyrics for the song / poem “Pantapon Rose” were published as a signed and numbered limited edition on tan paper. Created in West Virginia, this simple, yet beautiful piece prints Burroughs’ handwritten 7-line ditty. Pantapon Rose links back to Burroughs’ first broadside in Semina from 1959 creating a circular effect from the beginning to the end of his writing life. In 1994, White Fields Press of Louisville, Kentucky issued Burroughs’ “Remembering Kerouac” complete with a photograph of Burroughs by Allen Ginsberg. The comix legend R. Crumb illustrated a poster / broadside called Meet the Beats: William Burroughs in 100 copies. Like the broadsides featured on Ken Lopez’s website, these Burroughs items are printed on high quality paper with special attention to printing as an art. While many of the 1950s and 1960s pieces are incorporated into the larger wholes of the magazine format, the later items stand out as separate objects and demand to be set aside and framed. Written by Jed Birmingham and published by RealityStudio on 22 May 2006. Any discussion of broadsides should include the Oyez Press boradsides. They were extremely well designed and beautifully printed. There is a good history at the UConn site. A nice image is also available at the BPA Galleries site. I wonder if the artist James Silke, illustrator of the SNOTTY BABOONS broadside, was Sam Peckinpah’s art director/best friend? I think YES.